Home to over 50 species and 400 animals. Home to UK’s largest African elephant herd. Summer (29th March to 27th October): Last admission at 4.30 p.m.
Winter (28th October to 28th March): Last admission at 3.30 p.m.
Stagecoach Route 200 bus service provided by the Park. Bekesbourne Station. From there, a mini bus is provided by the Park. 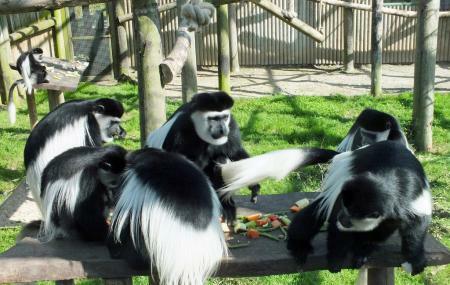 How popular is Howletts Wild Animal Park? People normally club together St. Mary's Church, Chilham and St. Lawrence Ground while planning their visit to Howletts Wild Animal Park. Went on a damp Sunday and some animals not out. Found coffee cafe prices on high side. At around £22 each entry steep. Venue does important work and suppose this and cost of running means entry costs have to be at this level. Will return when warmer weather arrives. One of my absolute favourite places to visit. They do incredible work. Lovely enclosures with very happy animals. Staff are very friendly and informative. They also own Port Lympne which has some amazing places to stay. Went there with my family without any expectation but was very positively surprised. Worth the money. Bigger and greener than expected. Liked the whole concept. Recommended. Really good day out. Lots of different animals to see. Also a treetop challenge for kids over 1.2m tall and adults that my son loved. Food and drink is expensive. 2 gift shops with a lot of different things. Really worth the day out. Great day out, plenty of parking space and nice staff. Walked 3.5 hours so legs are like jelly but great exercise. Only problem due to cold many animals were keeping warm don't blame them.